Print polished-looking church bulletins, invoices, billing statements, and registration receipts with the help of this configuration. Perforated on legal-sized sheets, it’s perfed with 1 column by 1 row and has a 3.5" margin on the bottom. 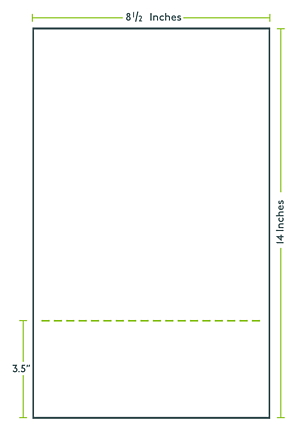 Legal (8.5" x 14") paper, micro-perforated in 1 col x 1 row. Compatible with just about any copy machine, laser printer, and inkjet printer. Select your card stock in cream or white. Super low prices, top quality. Shop PerforatedPaper.com for standard perforated layouts or design your own!